It is hot. We are experiencing temperatures over 100 degrees this week and we aren’t used to it. 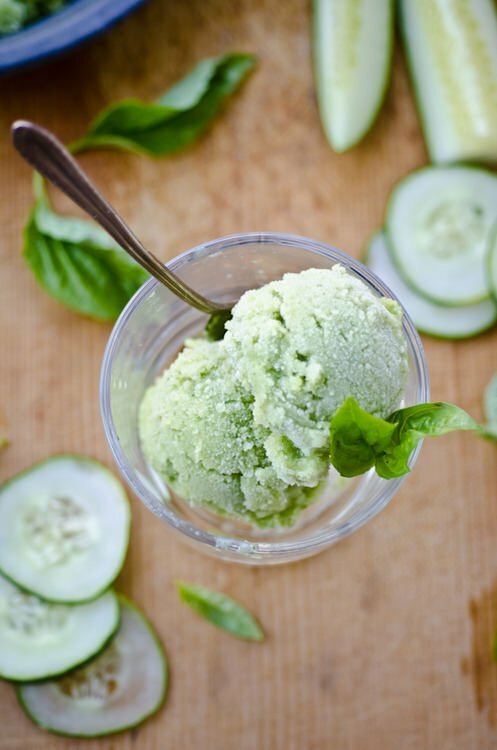 I want to do nothing more than sit in a nice cool bath and eat this icy cold cucumber basil sorbet. Regular ice cream, so rich and heavy seems like a poor choice when temperatures soar. 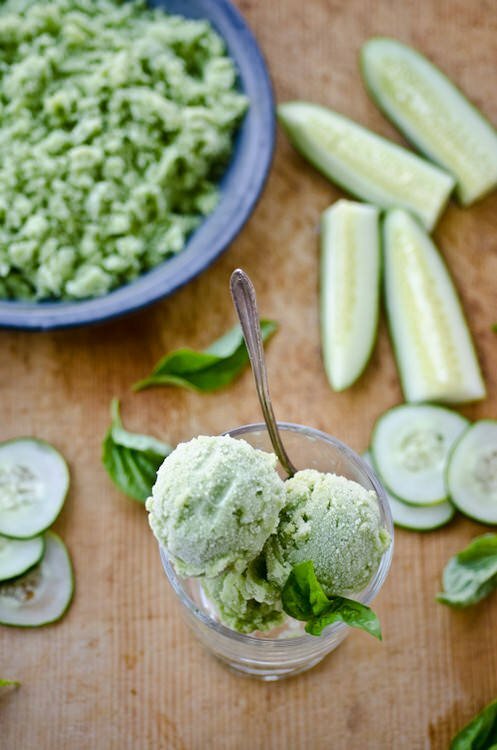 Utterly refreshing, there is nothing like the clean, fresh taste of cucumber to cool you down. Put all the ingredients in a blender and process until smooth. Transfer to a container and refrigerate until cold. Pour the mixture into an ice cream maker and process until the mixture is thick and creamy. This recipe looks fantastic and is just the kind of not-too-sweet sorbet idea I’ve been craving. Just discovered your blog tonight and I think it’s lovely. Cheers. This may sound silly but is there a way to make this without an icecream maker? 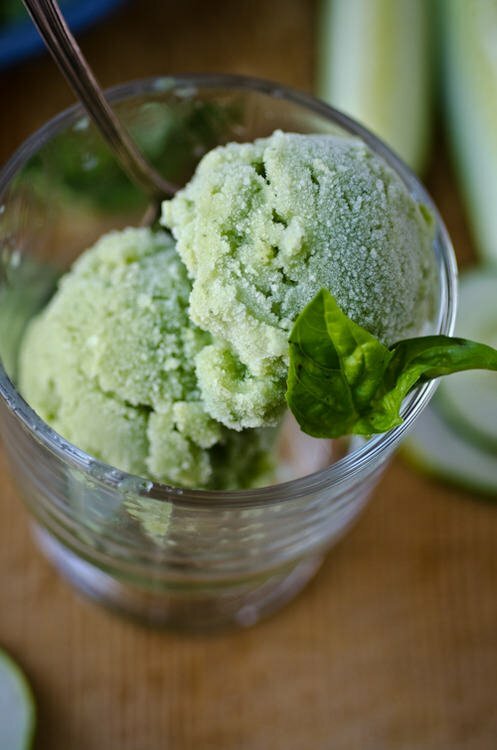 You can easily make this into a granita if you don’t have an ice cream maker. The texture will be slightly different but it will still be delicious. Pour the mixture into a large flat bottomed dish and freeze for 30 minutes. Stir the mixture thoroughly and freeze for another 30 minutes. Repeat the process every 30 minutes for 3 – 4 hours until the texture is slushy but not completely frozen. Let me know how it turns out if you give it a try! Looks delicious! Can’t wait to try it. Does this recipe still work without rum? You can definitely make the sorbet without the rum. When I first started making sorbet’s I had read that the addition of alcohol would help improve the texture, it reduces the freezing point so it will make it easier to scoop but it can also cause your sorbet to melt faster. Let me know how it works out without it if you try the recipe! I’m a writer with Care2.com and I’d love to include a link to this recipe in one of my articles. Is it alright if I also use one of your photos? Thanks! thanks for asking Zoe. Feel free to use the photo as long as it links back to the recipe!